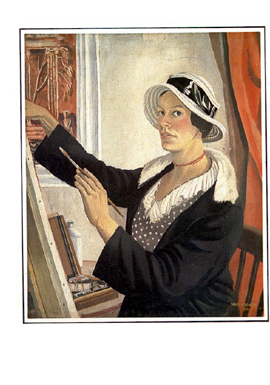 English mural painter and designer trained at The Slade where she won joint first prize with Rex Whistler in 1924. They both went on to work on their own murals at the Highways boys club in Shadwell. Many important mural commissions followed throughout her long life. She also designed UK postage stamps, illustrated books and exhibited easel pictures at The New English Art Club and Royal Academy. Her paintings are in many public gallery collections including The Tate, The Graves Art gallery Sheffield, The Imperial War Museum, Manchester City Art Gallery, The London Transport Museum and The University Art gallery Liverpool. There are also several surviving mural paintings. An exhibition of her work was held at The University of Liverpool Art Gallery 21 Jan-29 Apr 2005, Graves Art Gallery Sheffield 25 Jun-17 Sept 2005 and Kingston -upon-Thames Art Gallery 1 Oct - 19 Nov 2005. The illustrated catalogue Earthly Delights: Mary Adshead, 1904-1995, is available from The University of Liverpool Art Gallery, 6 Abercromby Sq. Liverpool L69 7WY. A map of the UK with locations and notes on accessible works is in the exhibition catalogue. Mary Adshead's husband Stephen Bone and on her father-in-law Sir Muirhead Bone were also artists.